In 1994, Jeff Bezos was already what many would consider extremely successful. The youngest-ever senior vice president at Wall Street investment banker D.E. Shaw & Co., the 30-year-old Bezos was already making an estimated six-figure salary and was destined to rise even further in the company ranks. But Jeff had other plans. Fueled by a secret passion for the infant business of electronic retailing, Jeff dreamed of creating his own company in the vast, then virtually uncharted wilds of the World Wide Web. It was a risky move, but it quickly paid off. Just four years after Bezos created Amazon.com, the virtual bookstore became the template for how e-commerce businesses should be run, with sales of more than $610 million and more than 13 million customers worldwide. Bezos first got the idea to start an Internet enterprise in 1994. While surfing the Internet in search of new ventures for D.E. Shaw & Co. to invest in, he came across the statistic that World Wide Web usage was growing by 2,300 percent a month. Bezos immediately recognized the expansive possibilities of selling online and began exploring the entrepreneurial possibilities of developing an Internet business. He drew up a list of 20 potential products he thought might sell well via the Internet, including software, CDs and books. After reviewing the list, books were the obvious choice, primarily because of the sheer number of titles in existence. Bezos realized that while even the largest superstores could stock only a few hundred thousand books, a mere fraction of what is available, a "virtual" bookstore could offer millions of titles. The die was cast. Bezos passed up a fat bonus, packed his wife, MacKenzie, and their dog, Kamala (named after an obscure "Star Trek" character), and headed for Seattle. For Bezos, Seattle was the ideal city for his new business. Not only was it home to a tremendous pool of high-tech talent, it was also in close proximity to Ingram Book Group's Oregon warehouse. While MacKenzie drove, Jeff spent the trip pecking out a business plan on a laptop computer and calling prospective investors on a cell phone. With $1 million raised from family and friends, Bezos rented a house in Seattle and set up his business in the garage. For nearly a year, Bezos and a crew of five employees worked out of the garage, learning how to source books and setting up a computer system that would make Amazon.com easy to navigate. 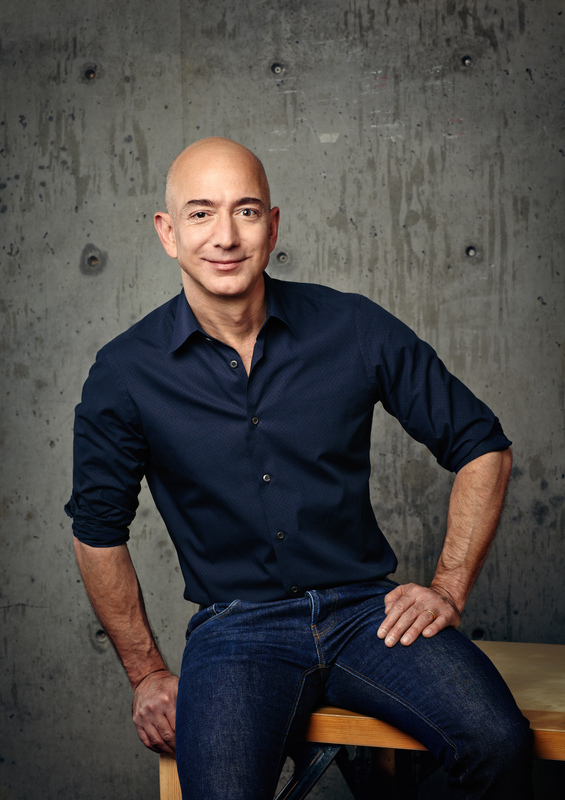 A true marketing visionary, in addition to creating a user-friendly interface that would streamline the "needle in a haystack" process that bookstore shopping often entails, Bezos wanted to establish a "virtual community" where visitors could "hang out." To achieve this goal, he and his team created a number of innovative programs, including one that would let customers add their own book reviews to the site and a feature that recommends books based on a customer's previous purchases. In July 1995, Amazon.com opened its virtual doors, calling itself "Earth's Biggest Book Store," with more than 1 million titles to choose from. Fueled by word of mouth, or more accurately, word of e-mail, Amazon.com rocketed off the line like a nitro-burning dragster. Enraptured by the enormous selection of books, the superior customer service and the user-friendly design of the site, Internet users ecstatically plugged Amazon.com on Internet newsgroups and mailing lists. The orders poured in, and by September 1996, Amazon.com had grown into a company of 100 employees and had racked up more than $15.7 million in sales. Three years later, those figures would rocket to more than 3,000 employees (including some in Britain and Germany) and more than $610 million in sales. Amazon.com's success did not go unnoticed by bookstore giant Barnes & Noble, who quickly put up its own Web site, www.barnesandnoble.com. To combat Amazon.com's claim that it was "Earth's Biggest Bookstore," Barnes & Noble embarked on an aggressive marketing campaign proclaiming that they offered twice as many books as Amazon.com. But it was a strategy doomed to failure. The forward-thinking Bezos had already expanded Amazon.com's product line to include CDs and replaced "Earth's Biggest Book Store" with the tagline "Books, Music and More," leaving Barnes & Noble, as one writer put it, "wrapping its fingers around the neck of a phantom." Amazon.com has continued to stay ahead of its closest competitor, boasting 85 percent of the Web book market to Barnes & Noble's 11 percent. But that may soon change. In fact, in the near future, they may no longer even be considered competitors. After his successful venture into the music market, Bezos set his sights on expanding Amazon.com into other markets. Shortly before the 1998 Christmas season, Bezos added a temporary gift section to Amazon.com, where customers could buy toys and games. He also began experimenting with "Shop the Web," a program giving Amazon.com a commission for directing its customers to other, noncompeting online retailers. In late January 1999, Amazon.com went after the $150 billion U.S. pharmacy market, buying a share of Drugstore.com, a company that sells everything from breath mints to Viagra online. To cash in on the growing popularity of online auctions such as eBay and uBID, Amazon.com joined Sotheby's Holdings Inc. in June 1999 to launch the online auction site sothebys.amazon.com. As if that weren't enough, less than a month later, Amazon.com officially added two new sections to its site that offered toys and consumer electronics. All this begs the question, What is Bezos up to? Is he trying to make Amazon.com the Web's first superstore? Perhaps. In a March 1999 PC Week article, he explains, "We are trying to innovate in the e-commerce arena. That's our heritage. We are building something that can't be pigeonholed. We defy easy analogy. It's not a vision that can be communicated in a sound bite. We want to be the most customer-centric company in the world. Come and discover and buy anything online." When Jeff Bezos first started his virtual venture, he wanted to call the company Cadabra, as in abracadabra. He phoned his Seattle lawyer to try out the name, but the attorney misheard Bezos and replied, "Cadaver! Why would you want to call your company that?" Bezos quickly reconsidered and adopted the name Amazon.com, after the world's second-largest river. Perhaps one of the most remarkable things about Amazon.com is that even though its sales are growing at a rate of 3,000 percent annually and it is the country's third-largest bookseller, the company has yet to make a dime. In 1997, Amazon.com lost about $30 million, followed by another $1.25 million loss in 1998. But that doesn't bother Jeff Bezos. "To be profitable [now] would be would be a bad decision," he told PC Week. "This is a critical formative time if you believe in investing in the future." Bezos' plan is to forego profits, at least initially, in favor of establishing brand-name recognition. To this end, he has poured most of Amazon.com's revenue into marketing and promotion. "There are always three or four brands that matter," Bezos says. "With the lead we have today, we should be the No. 1 player."